Jack said he wrote “Horrie the Wog Dog” from Jim Moody’s diary. Recently I was asked about this diary, where it might be found and how Jack came to get hold of it. I replied to the enquiry and also asked for information from visitors to this site. From this question Ann Bullen, Jim's youngest daughter, contacted me with a wealth of information about both Horrie and Jim Moody. In 1945 Jack published his book “Horrie the Wog Dog” (Angus and Robertson). The book was written by Jack from material provided by Private Jim Moody (VX13091) who was an Australian soldier serving in 6th Division AIF in the Middle East during World War Two. Jim Moody was Horrie’s “owner” (if such a thing was possible!). The book is written in the first person as though Jim is telling the story. Horrie had some remarkable adventures in Egypt, Greece and Crete before Jim smuggled him back to Australia. war heroes, we shall remember you. was destroyed on 12 March 1945. “Horrie the Wog Dog” was published in America (Bobbs-Merrill, 1945) as “Dog of the Desert” for reasons of political correctness and there were some minor alterations for the same reason. It also had a happy ending – Jack’s Epitaph was omitted. accompanying proofs of the book ‘The Wog Dog’”. a deliberate breach of the law. our officers and, by my direction, it has been destroyed”. However there is another ending to the story that was suggested and first published by the author Anthony Hill. In 2002 Hill met a journalist Norma Allen. Allen said she was a cadet reporter in 1946 when she interviewed Jim Moody. She told Hill that Jim had searched the local pounds until he was able to buy a similar dog for “five bob”. In this version of the ending of Horrie’s story he was smuggled to Corryong in Victoria where he lived for the rest of his life. Hill said he traced Jim’s children and close friends and they confirmed the story. Anthony Hill published an abbreviated version of Horrie’s story in his book “Animal Heroes” (Penguin, 2005). Now there is another version of Horrie's story. Roland Perry has written “Horrie the War Dog” (Allen and Unwin, 2013) a "dramatized and re-created" version that is quite silly in places. He imagines conversations between long-dead people and his stilted attempts are painful to read. Worse still he ignores "Horrie the Wog Dog" and even blames Jack for Horrie's demise. (a) Was Jim Moody the archetypal irrepressible Aussie larrikin? (b) Where is the diary to which Jack referred? (c) Was Horrie destroyed by the quarantine service? Although Jack did not describe Jim Moody’s personality as such (the book was written in the first person from Jim’s point-of-view), Jim was one of the “Rebels” constantly bucking authority, going absent without leave and defying rules and regulations. Jack portrayed the Rebels (including Jim) as the legendary larrikin Australian soldiers. And of course, this must have been fairly accurate. There is a fair amount of the daredevil in the Rebels’ smuggling of Horrie from Egypt to Greece on to Crete, to Palestine and Syria and then on to Australia. Roland Perry much exaggerated the picture of Jim. In his book Jim comes across as a swash-buckling rascal. He is portrayed as a hero with a heart of gold always fighting the injustice of insensitive bureaucracy (whether representatives of bureaucracy were Army Officers, ships’ captains or civilian authorities). However, from the information I have received from Ann Bullen, the real Jim Moody seems to have been quite different. He seems to have had a much darker side than the cheeky irreverent larrikin portrayal in Perry’s book (and to a lesser extent, in Jack’s book). For example, Jim was unable to attend his brother's wedding in November 1944 because he had been on the run AWOL since April 1944 and at the time of his brother's wedding he was being detained in Army barracks. I will add more of Jim Moody's story later on a special webpage. I believe some of the words I will write on that page might be controversial for members of Jim’s family and perhaps others who knew him. I cannot hope to mediate the various opinions but I can guarantee to publish anyone's views provided those opinions do not contain personal acrimony. Jack said “Horrie the Wog Dog” was “Written from the diary of J B Moody”. This seems to be confirmed by a letter from Walter Cousins to R M (sic) Wardle, Director of Veterinary Hygiene, Canberra (Appendix One). In this letter Cousins wrote, “This book is written by a soldier named Moody who brought it to us in diary form”. Perry repeats Jack’s assertion that Moody had a diary. Indeed Perry exaggerated the assertion. Perry wrote that Moody was distressed after he and Horrie were rescued from the sinking Costa Rica; “All his wonderful photographs, diaries, keepsakes and other personal items such as letters received on the trip, were now deep with the fishes of the Mediterranean” (p159). This has to be one of Perry’s “dramatizations”. If such an event had happened Jim would certainly have mentioned it in his manuscript and it would certainly have appeared in the subsequent book, "Horrie the Wog Dog". Perry said Jim rewrote the diaries (p280) and would send batches of the rewritten diaries to his father who would then send them on to Jack. That is not true. Jim was sending the answers to Jack's questions about Jim's manuscript. Perry said that after Jim had contacted Angus and Robertson the firm commissioned Jack to write the story based on Moody’s diaries (p280). None of this is correct. Jim Moody did not present a diary or batches of rewritten diaries to Angus and Robertson. Ann Bullen said there were no diaries and no diaries were ever mentioned in Jim’s correspondence. Jim approached Angus and Robertson in 1943 with a manuscript. This is confirmed by Jack’s first letter to Moody. Ann and another family member believe the concept of a "diary" was more likely an invention by Angus and Robertson as a marketing plan to add authenticity to the story. Walter Cousins of Angus and Robertson (a good friend of Jack’s) forwarded the manuscript on to Jack. Jack then wrote to Jim Moody. Jack proposed the joint project between himself and Jim Moody.After Jim had agreed to a collaborative book, Jack sent a series of questions to flesh out the story. There is no doubt about this assertion. The first document on the next webpage starts with the words, “Dear Mr Moody, Mr Cousins, of Angus and Robertson Ltd., has handed me your M.S. re the Wog-dog, with the idea that we might make a book of it”. Then the next documents on the same page are the five pages of questions Jack put to Jim Moody. Not only does this information dispel the idea that a diary was presented to Angus and Robertson it also makes nonsense of Perry’s claim that it was Idriess who had to persuade Jim Moody to write the book. Although it is true that later Moody had begun to have doubts about revealing Horrie’s existence, he had started writing a book about Horrie several years earlier. Jack believed Horrie was destroyed. It was not until nearly six decades later that another version of Horrie’s fate emerged. Anthony Hill wrote Horrie’s story in “Animal Heroes” and he also revealed what he believed was the real story of Horrie's fate – that Jim Moody substituted another dog for destruction and Horrie lived a long life in secret. But did Horrie die at the hands of the Animal Quarantine Service? THE FACTS are that Jack thought Horrie died under Quarantine Regulations at 4.00PM on 12 March 1945. Angus and Robertson were unequivocally told of this fact by R N Wardle Director, Division of Veterinary hygiene (Appendix Two). Horrie had arrived in Australia in April 1942 and he stayed with Jim’s father in Melbourne while Jim was posted to New Guinea. Some time in the first half of 1943 (while Jim was still in New Guinea) Jim sent a manuscript of Horrie’s story to Angus and Robertson (see the correspondence on the following webpage). It was in June 1943 that Jack wrote his first letter to Jim but Jim was not discharged until 5 February 1945 so most of their correspondence was to and from New Guinea. It is not clear how Jim was corresponding with Jack while Jim was AWOL in 1944. Perhaps Jim's father, Henry, remained as the conduit. Publicity about Horrie’s existence began shortly after Jim’s return. On 12 February 1945 an article about Horrie’s story appeared in the Sydney “Sun”. It was this article that drew the attention of the authorities to Horrie and Jim Moody. Then on 21 February an article appeared in The Army News along with a photograph of Jack with Horrie. There were probably other press articles. Perry blamed Jack for a publicity stunt in which Jack did not care whether Horrie lived or died as long as the stunt sold the book he was writing. This is as insulting to Jack’s memory as it is wrong. Not only had Jim already started on a book which he submitted to Angus and Robertson but also on 19 March 1945, the Secretary of the Kennel Club (Mr Somerville) wrote to the Director-General of Health (Dr Cumpston), saying inter alia, “Mr Moody approached (Mr Forrest) some time ago and offered to display the dog as a Side Show, the proceeds from which would be donated to the Red Cross Convalescent Homes.” (Appendix Three). Also, in a letter dated 2 March 1945 Jim wrote to R N Wardle. In that letter Jim admitted responsibility for the publicity that drew the attention of the authorities to Horrie. Jim was contacted promptly. On 19 February 1945, he was contacted by a Mr Stevens of the Division of Veterinary Hygiene. Jim was taken to Animal Quarantine Department where on I March 1945 he promised a Mr King he would surrender Horrie on 9 March. Horrie was still alive when, on 2 March 1945, Walter Cousins wrote to R N Wardle with a plea for clemency. He enclosed the galley proofs of “Horrie the Wog Dog”. On 9 March 1945 Jim took a dog (Horrie?) to the Animal Quarantine Service. A Seizure Form for an “Egyptian Terrier” is dated 12 March. Jim had been advised that there was a possibility that the dog might not be destroyed but he was given no absolute assurances. (Appendix Four). The dog (Horrie?) Jim delivered to the Animal Quarantine Service was destroyed at 4.00PM on 12 March. Wardle waited until the dog (that might have been Horrie) was destroyed before replying to Cousin’s letter on 13 March 1945. On that day (the day following the dog’s destruction) Jim visited the Department of Agriculture asking to be shown the authority from the Minister which gave permission to destroy the dog. If, in fact the dog was not Horrie, why would Jim feel sufficiently aggrieved as to question the decision? Perry, on the other hand, has the Rebels partying merrily after the death of the alleged substituted dog (p8). There was then an unprecedented public outcry. The extent of public concern can be seen in the threatening letters held by the National Archives (A11984, V213). Although overly dramatized, for the first time Perry has effectively documented the public outrage. But what happened to Horrie if he was not destroyed? What are the facts? Anthony Hill quoted Norma Allen (or perhaps James) who claimed there was a substitution. Perry elaborated on the substitution story and said Horrie lived out his life in Cudgewa near Corryong in Victoria. However, there is documentary evidence to the contrary. This evidence is in the form of letters written to Jim from Jim’s father (Henry Moody), Jim’s mate (Capt Jim Hewitt) and a good friend who lived in Cudgewa (Myra Dyring). It is inconceivable that, if the substitution did occur, that Jim would not have confided in these people. In another letter Henry was conveying indisputable concern for Jim. In this second letter (Appendix Six) Henry wrote to Jim, “I saw Mr Wilson again & he also read yr letter of 11th apparently they also were concerned over the way Horrie had been done to death and asked me to let him know what the contents of your confirming letter were as I had not then received. He seemed to expect that the Syd R.S.L. would be taking the matter up. Whatever happens, Jim I want you to keep away from any active part in it. You have nothing to blame yourself for. You did a splendid job for the little dog while he was alive& don’t blame yourself for what happened thro’ trusting to the honour &decency of men who apparently did not possess those virtues & consequently could not realise what that dog represented to the chaps who had been in the fighting. It is not possible for a backside hero sitting in a safe & cushy job to realise it. Nothing of note has happened here … all the rest of the family appear well but very sad over the death of the little hero dog. Cheerio, eh Jim and do not go brooding over this business and remember please that whatever happens I want you to keep out of it as no doubt you will be a marked man for some time & if any lawlessness occurred you would probably be framed for it”. If Henry Moody had known Horrie was still alive he would surely have not penned such emotionally charged letters. Could Jim have revealed the secret much later and only after putting his father through this anguish? No - it is not logical to accept that Featherstone, Brooker, Hewitt, Gill, Bennetts (and who knows else) were in on the substitution secret but Jim’s own father who had cared for Horrie was not told. It is beyond belief. 2 Capt Jim Hewitt on 6 April 1945 sent a postcard to Jim Moody (Appendix Seven). He wrote, “Dear Jim, At last the silence is broken – but then the death of Horrie would break anything … I take particular pride in what little I did to help getting him home. The bastards.” There is no reason why Jim would keep the substitution story from Jim Hewitt. 3 Myra Dyring also sent letters to Jim (Appendices Eight to Twelve). She knew Jim well. Her adopted father ran the Post Office/General Store at Cudgewa. Myra's letters lament the destruction of Horrie and express her sadness that she did not get to meet him. If Horrie was living just down the road in the tiny village of Cudgewa, Myra would have known and would have no need to send those letters. 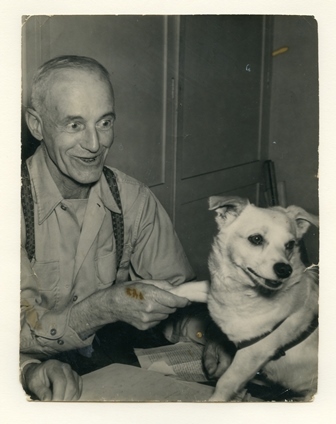 THE ALLEGATIONS are that between 19 February 1945 and 9 March 1945 Jim Moody searched in the Sydney dog-pounds for a look-alike dog and surrendered this dog for destruction. Anthony Hill said this substitution secret was revealed to him at the launch of his book “Young Digger” at the Australian War Memorial. He said Norma Allen, a veteran journalist who was also a friend, suggested that Hill should write the story of what really happened to Horrie. Hill said Norma Allen broke her silence and told him the tale of a substitute dog. She said Jim Moody had told the story to her. Anthony Hill wrote that, “Even then, Norma offered a silent ‘Sorry, Jim’ for the past can throw long shadows into the present”. Some of Jim’s family believe Norma Allen knew Jim very well and that she was not an entirely impartial witness. It was said to me that Norma Allen did not ever produce proof of the substitution – she just repeated a story told to her by Jim nearly sixty years earlier. March, the day before the dog was destroyed. So Hill's "confirmation" was little more than people repeating what Jim Moody said – that he had substituted a “five-bob” dog for Horrie. The story that Norma Allen told to Anthony Hill was that, with Horrie’s seizure imminent, Jim searched the Sydney pounds until he found a similar dog that he bought for “five-bob”. It was this dog Jim said he gave up to the authorities and it was destroyed in place of Horrie. According to this (happier) story Moody and the Rebels had the last laugh on authority. Horrie was said to have been whisked away to a farm near Corryong in northern Victoria. He was said to have lived his life there and sired many puppies. The Perry version is a dramatization of the Anthony Hill substitution story. He devotes thirty-eight pages of fabricated conversations to tell how Jim fooled the authorities with a substitute dog and spirited Horrie away to a farm at Cudgewa near Corryong. Perry mentions a man named Eddie Bennetts (p330). According to Perry, Bennetts had a dairy farm at Cudgewa and Horrie lived out his life there until he was run over and killed on the road at Log Bridge near Cudgewa. From where did Perry get this information? It came mainly from Bennett’s son who would not have been born in 1945. Indeed Bennett's son would have been very young or even not yet born when Horrie was alleged to have been killed on the road near Cudgewa. It appears as though Perry’s re-creation of the “idyllic surroundings” (p330) in which Horrie lived out his life are again just hearsay. In support of the substitution story Perry claimed to have found a photograph of Horrie’s pups. The photograph in Perry’s book (facing page 249) purports to be “Imshi II” and the pups sired by Horrie. However, Jim's second wife Joan said Jim never claimed they were Horrie’s pups and she said Jim said they were purebred West Highland Whites. The same pups appear in family photographs. So what do the members of Jim Moody’s family think of the substitution story? Obviously Roland Perry has a version of events from two of Jim’s children, Leonie and Ian, because he acknowledges talking to them. It can reasonably be assumed that they support the substitution story. However, within the family the substitution story is quite contentious. The fact is that the publication of Horrie the Wog Dog had a disastrous effect on Jim, an effect that still reverberates within the family to this day. However, the first point that must be made is that Joan Booth and Jim Moody did not become a couple until after the events of 1945. They married in 1951. None of their children can positively confirm or deny that the substitution story is accurate. Joan had never met Anthony Hill until the launch of Hill's book in 2005. After Joan had read the book she said it was nonsense and she didn't believe the substitution story. Ann Bullen also does not believe the substitution story. Ann says, “All the evidence we have points to Horrie being destroyed”. In the extended family, opinion is also divided. Ann Bullen says that her older cousins (from Jim’s first wife’s family) either don’t believe the substitution story or tell of their parents warning Jim not to disclose Horrie’s existence. For example, Jim's brother Bob, his wife Dorothy and their two children lived with Henry Moody (Jim’s father) until about 1954. According to Ann, Bob’s daughter Kaye recalls that in her family the substitution story was not believed and Horrie was destroyed. Ann says, “Of all the people Jim would have told if the substitution was true it would be his brother and his father”. SO, WHAT WE HAVE NOW are some indisputable facts based on documents sourced from the time Horrie (or another dog) was destroyed in 1945. Some of Jim’s family believe these facts and believe Horrie was destroyed on 12 March 1945. Then we have the substitution story based on what Anthony Hill said Norma Allen said Jim Moody said (that Horrie survived because of the substituted dog). Anthony Hill said Jim’s children, Ian and Leonie, and also Brian Featherstone (the last surviving Rebel) and his wife Betty Featherstone confirmed the substitution story. But what did they know (as opposed to what they were told by Jim Moody)? To illustrate, Perry said there was a Rebel’s surprise party on March 12 1945 at which Gill and Featherstone were said to be present when neither man could possibly have been there. 1 The photograph in Perry’s book facing page 249 purports to be “Imshi II” and pups sired by Horrie but Joan said Jim never claimed they were Horrie’s pups and that Jim said they were purebred West Highland Whites. The same pups appear in family photographs. 2 If the substitution did take place, Jim obviously did not confide in his father – the man who had cared for Horrie for three years while Jim was still in the Army. 3 Neither did Jim tell his friend Capt Jim Hewitt. 4 Myra Dyring’s letters are convincing. In such a tiny community as Cudgewa (or indeed Corryong) Myra would have had to have known if Jim was visiting Horrie (as alleged by Perry). It is almost impossible to believe (given the tone of her letters) that she would not have known of Horrie’s existence if in fact he was alive. So, sadly, in the absence of any concrete evidence against the facts, it looks like Horrie did die at the hands of over-officious quarantine officials.